DC Universe Animated Original Movies - BATMAN: UNDER THE RED HOOD | Warped Factor - Words in the Key of Geek. Da'Mon Guy starts a new series looking back at the direct-to-video releases from Marvel Animated Features and DC Universe Animated Original Movies. First up it's the 2010 release from DCUAOM, Batman: Under the Red Hood. Batman: Under the Red Hood is one of the best animated movies of recent years. It features a great storyline as well as great traditional animation, and is an excellent combination of action, mystery and suspense. It adds a new dimension to the ever evolving character of Batman, and showcases a great voice cast featuring the talents of Bruce Greenwood (Double Jeopardy, Star Trek), Jensen Ackles (Supernatural, My Bloody Valentine), Neil Patrick Harris (How I Met Your Mother, Doogie Howser), and John DiMaggio (Futurama). Batman: Under the Red Hood is loosely based upon two of DC comics greatest selling mini series - A Death in the Family and Batman: Hood. The movie begins with the death of Robin at the hands of Batman’s archenemy, the Joker (John Dimaggio). Batman (Bruce Greenwood) races furiously to save his partner but fails and witnesses his death. The story then picks up 5 years later as Batman is in hot pursuit of Gotham's latest vigilante, the Red Hood (Jensen Ackles). The Red Hood uses many of Batman’s methods but takes no prisoners, he has no problem with killing anyone who may pose a problem in his conquest of Gotham city‘s underworld. 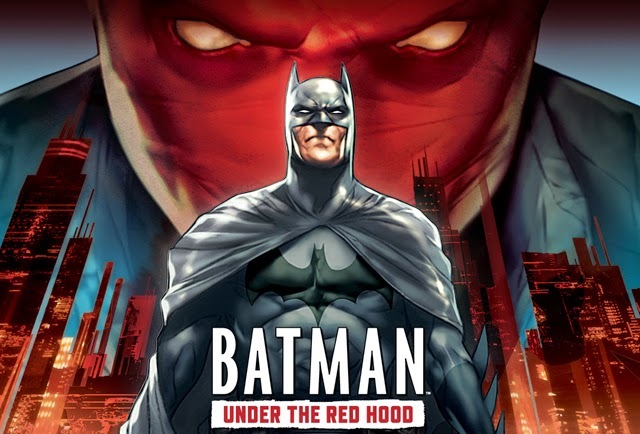 Batman: Under the Red Hood digs deep into the character of Batman and shows us multiple layers to his personality that are not often displayed. We see his vulnerability as he revisits the father figure/ partnership that he lost when Robin was killed. We are also shown how he has struggled with the grief or Robin’s death and his failure to save him. By showing us his flaws, the movie grounds him and adds a human, and more real, aspect to the larger than life persona of Batman. The other main characters in Under the Red Hood are also portrayed very well, with each of them adding a distinct element to the story. The Joker is played at his maniacal best right from the start. His crazed, psychopathic tendencies are on full display as he adds to the mayhem that Batman must overcome. Nightwing, the first Robin, brings a bit of humor to this otherwise dark movie, whilst the Red Hood gives a view of Batman’s dark side. He shows us what Batman could become if he ever lost sight of his sense of justice. Batman: Under the Red Hood is a great movie, and will satisfy both comic book lovers as well as casual fans. This is one of those transcendent movies that becomes more than just a good animated film, it's simply a good film. It’s excellent viewing and has definitely become one of my instant classics.